Waterbury Clock Co., porcelain clock, "Parlor No.99", ca 1900. 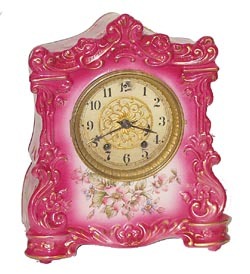 A very pretty clock with red and pink colors, and lots of gold accents. Stands 11 inches high, no chips or repairs. Label on the back, correct pendulum and back door. The movement is 8 day and running, strikes a gong on the half hours. French sash, gilt center cover, paper dial is not in the best condition but is adequate.